It’s a good idea to have a basic understanding of your central air conditioning unit. 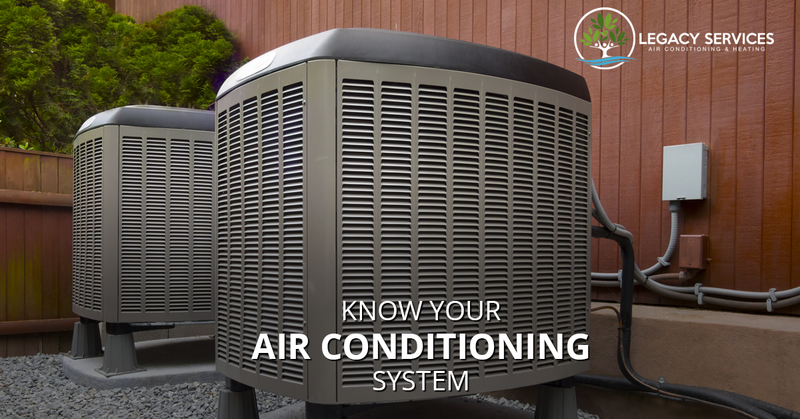 Having a general understanding of an air conditioning system’s main components can not only help you understand its function, but can also help you identify when your air conditioning unit needs attention this summer. That’s why we at Legacy Heating and Air Conditioning composed an outline of the basic features and functions of an air conditioning system to help you recognize when your system is functioning properly versus when it needs to be serviced. Your central air conditioning system is typically made up of two parts: the indoor unit (air handler or furnace with an evaporator coil housed within a metal box called a plenum) and outdoor unit, both of which are designed to work together to efficiently condition the entire home’s temperature. The outdoor air conditioning system is designed to pull out the warm indoor air and push cooler refrigerated air back into the home. A condenser and compressor are housed within the outside unit of the air conditioning system as mentioned above. It is the piece of equipment you’re most familiar with seeing and hearing: the big, round fan mechanism that sits just outside the walls of the home, usually tucked under or behind shrubbery. The condenser is responsible for managing the temperature of the refrigerant (most likely Freon) that travels to and from the house. Through a series of coils, the condenser works together with the compressor, the heart of the air conditioning system, which pressurizes and transforms the refrigerant vapor into liquid form. The liquid vapor is then transferred back into the house by condenser fans also identified as the blower unit. The cold gas travels through the condenser coils and is blown by the condenser fans through a series of tubes and ductwork. thus creating a cool, comfortable environment within the entire home. The evaporator coil cools the air when your thermostat is set to lower temperatures in the summer months. Housed within a metal enclosure called a plenum usually located on the furnace’s exterior, the evaporator coil works similarly to an automobile radiator to produce cool air, which then travels through the ductwork. Air filters are a key component of the air conditioning unit which help regulate the quality of air traveling from the AC unit into the home. Filters are usually located at the blower unit and are very easy to change. You’ll want to replace air filters every one to three months to maintain optimal air quality and air conditioning performance. The ductwork is a system of air duct vents within the house which allows the air conditioning system to constantly pull air from the home and to replace it with cooler air that is sent back into the home. It’s important to make sure that these areas are not blocked by furniture, rugs, or other household goods which could obstruct proper airflow. It’s also a good idea to inspect these ducts to make sure that nothing has made its way into the spaces. Air conditioning systems are a crucial aspect of homes in the New Braunfels region. That’s why at Legacy Heating and Air Conditioning, our top priority is helping you maintain a consistently comfortable temperature within your home. We hope that this general overview of the main components and functions of a central air conditioning system has helped give you a basic understanding of these systems. If you have any questions or would like to schedule an appointment for repairs or replacement, call our HVAC experts today and schedule a free estimate.